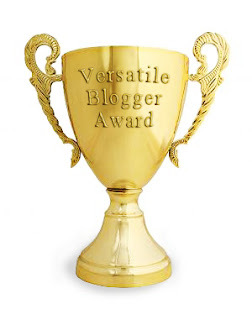 I was awarded the Versatile Blogger award by Paulette of Paulette's Blog. Since Paulette is a new blogging friend, I graciously accepted this award. Many of my long time blogging friends now have award free blogs. So I'm sure I'm breaking all the rules by not nominating 15 blogs. I have so many wonderful encouraging blogger friends that have been so supportive over the years. I've had the privilege of meeting some of them in person. It's so different when you already know someone's heart from their writing. It's like old friends meeting. I am a Christian who loves Jesus. I have been married to my husband Greg for 27 years. I am a native of New York; from Lindenhurst, Long Island. I'm still in touch with many of my friends from high school despite the long distances. I love children and am currently working in a private school class of 19 Pre-K 3 kids. I worked as a cardiovascular nurse specialist for 25 years and thought I was retired. Most of my family now lives in Florida. I can think of so many blogs I would love to give this award to right now. So please feel free to take this award and share 7 things about yourself. To which I'd add: 1) She has an indominatable spirt!, 2) She is a faithful/loyal & devoted friend, 3) She is superb at making lemonade out of life's lemons! Congratulations Debbie, absolutely you deserve it!!! Congrats Debbie! I love that the award is the "Versatile Blog" award. You do write about so many things...but the most overwhelming thing permeating your posts is your love for Jesus! You are always such an encouragement to me!